Painting Acrylic on Canvas | 18" x 18"
Mixed Media Mixed Media on Canvas | 32" x 43"
Mixed Media Mixed Media on 100% Acid Free Reg Paper | 36" x 55"
They say art and science are two different parts of the world, two different spheres of the human brain; but I find them both together. I don’t see one without the other and this unquestionable bond surfaces in my compositions. I draw inspiration from my own life, the way I have seen science and spirituality meet and create a mysterious confluence of life itself. 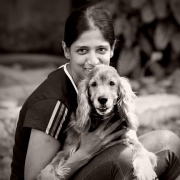 Anjali Ponni Rajkumar, is an artist with a very interesting background. She earned her Bachelor’s in Arts from Franklin and Marshall College, USA and a Masters in Biotech program from University of Pennsylvania. She has been a part of various group and solo shows and exhibitions. Her works are a combination of oil paint, acrylic, charcoal and sometimes photos and graphics. . Although her art is abstract though in nature, her paintings speak of the deep connect that art and science share.